Support the craft beer industry in North Carolina by raising awareness of regulations that stifle growth. All funds raised will be paid directly to Libertarian Party of North Carolina for the cause of liberty in North Carolina. The Libertarian Party of North Carolina supports Craft Freedom, an association bringing awareness to regulatory issues affecting the growth of the craft brewing industry. 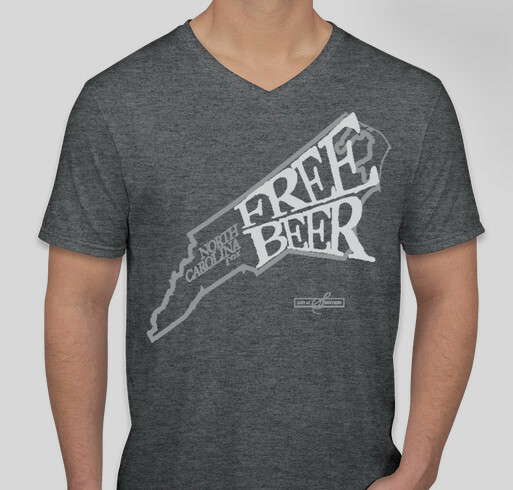 Show your support by wearing our North Carolina for Free Beer t-shirt and by signing the petition at CraftFreedom.org. The Libertarian Party of North Carolina supports, but is not associated with Craft Freedom. Proceeds from this campaign will benefit the cause of liberty in North Carolina. North Carolina has a prosperous and booming craft brewery industry. It’s brought in $1.2 billion dollars and created more than 10,000 jobs. For some politicians and special interests groups, this success is a problem. Large distributors, with government-granted monopolies on transporting alcoholic products, lobbied for laws requiring any brewery producing more than 25,000 barrels per year to use their services. Distributors then gain total control over where craft beers may be sold. Local breweries like Olde Mecklenberg, NoDa and Red Oak now produce near this cap. They must decide whether to keep growing – and hand over 30 percent of their revenue to someone else – or remain small. House Bill 67 would raise the barrel limit to 100,000 barrels. There’s no reason to use the law to keep big distributors profitable. Big beer industry players based in places like Belgium shouldn’t be allowed to keep NC’s beer industry from growing. How can you help? Go to CraftFreedom.org and sign their petition. Let your state legislator know how you feel. And the next time you’re in your favorite watering hole, tell the owner or manager that you support craft beer and ask them what they’re doing to help. Rigged markets hurt small businesses in NC. Free, fair markets for all NC businesses. Supporting free enterprise for smaller breweries and eliminating needless government regulation that only helps large distributors. I became passionate about NC craft beer ~6 years ago. Simultaneously I was becoming more liberty minded, and more annoyed with bad laws that restrict small business. I hope to one day see the free market thrive, and watch all our breweries succeed. Share Why You Support "North Carolina for Free Beer"